Chandler AZ 55+ Communities offer homes for sale now! Are you looking for a home in an Arizona 55+ Community? Chandler AZ 55+ communities are plentiful, but inventory is low and buyer demand is strong. Who wouldn’t love living in a gated, active adult community with resort amenities? Living in a 55+ community is living a vacation lifestyle every day. Imagine waking up every day only to decide whether to play golf, tennis, pickle ball, cards, senior softball, or relax at the pool! That is what you get when you buy a home in an active adult retirement community. Chandler, Arizona is located in the southeast valley of the Phoenix area and home to several 55+ communities. Sun Lakes is the largest of the Chandler AZ 55+ communities with just under 10,000 homes and five separate neighborhoods. Solera, a Dell Webb community, is nearby with 1,149 homes. And, Sunbird offers 1,631 homes. Lone Tree is a Pulte community with new-build construction. All of the other communities are completely built out. What’s so great about the Chandler communities is the location to major airports, all freeways, shopping, restaurants, museums, and theater. The Price Road Corridor is also nearby with major employers like Pay Pal, eBay, Nationwide, Wells Fargo, and many other corporate giants. Chandler retirement communities are full of people who follow their kids and grandkids to Arizona. Looking for a Great Lifestyle? Chandler AZ 55+ communities offer a lifestyle that is second-to-none. Each community offers golf, tennis, pickle ball, restaurants, fitness centers, hiking and biking activities, card clubs, and so much more. 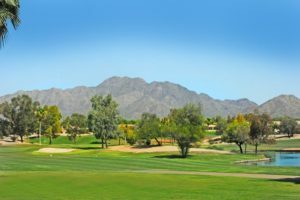 Sun Lakes, Arizona offers 99 holes of golf, 27 tennis courts and 12 swimming pools. Enjoy a nice stroll around Diamond Lake in Oakwood at Sun Lakes, or take in a game of senior softball. Lone Tree is the only 55+ community in Chandler that does not offer amenities. Lone Tree is for the 55+ community that enjoys all adults and new construction. Ready to learn more about Chandler AZ 55+ Communities? See the short video below featuring Sun Lakes, Sunbird and Solera then contact us here or call us at 480-440-0849. The Kolb Team is your Arizona 55+ real estate specialist!